Hi guys! It’s Molly. I’m taking the helm when it comes to Star Wars here at Christy’s Cozy Corners. 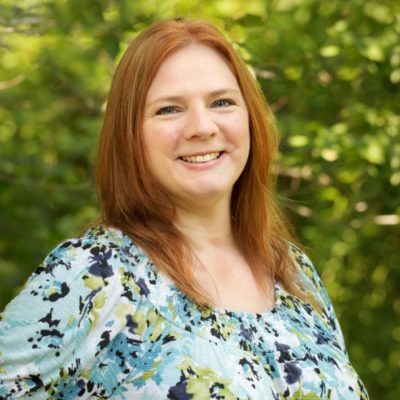 Mom (Christy) loves Star Wars, too, but she’s entrusting me with a bit more blogging responsibility. The new Star Wars movies really reignited my love for Star Wars. Now I’m ready to share that love with the rest of you! Although Star Wars has always been a part of my life (insert tales about childhood light saber duels and endless fights with my brother over LEGO Star Wars), it wasn’t until Star Wars: The Force Awakens came out that I really began appreciating the amazing world that is Star Wars. I never really understood why the prequel trilogy receives so much criticism. I couldn’t wrap my mind around not only watching all of the movies, but also reading all of the books and exploring the lore that acts as a sort of backbone to the franchise. I still haven’t read any of the books. I still haven’t dug into the Star Wars lore. I still don’t really understand why the prequel trilogy gets so much flak. I am part of a new generation of Star Wars fans (millennials represent!) and it was the new Star Wars movies that finally made me fall in love with this crazy genre-bending world. Now, I am a firm believer that the book is always better. (Meaning, the author is the better interpreter of the story than the film crew). I’m sure some fans have plenty of reasons why they’re disappointed with various aspects of the new Star Wars movies. Again, (and I’m being completely open with you guys), I don’t know everything there is to know about Star Wars. What I do know is that I finally understand why Star Wars is so important and why people love it. I don’t want to get into a debate about the original films versus the new films. Instead, I want to share with you the three (main) reasons why I think the new Star Wars movies are important, and why they are important to me personally. The new Star Wars movies are breaking these trends. In fact, the sequel trilogy’s three main protagonists break this mold entirely: Rey is the strong female lead, and both Finn and Poe give the movie a culturally diverse cast. Not to mention Leia, the epitome of a strong female lead, and Rose, who is both a female and non white character. Of course, it’s not just the new trilogy that features diverse representation. 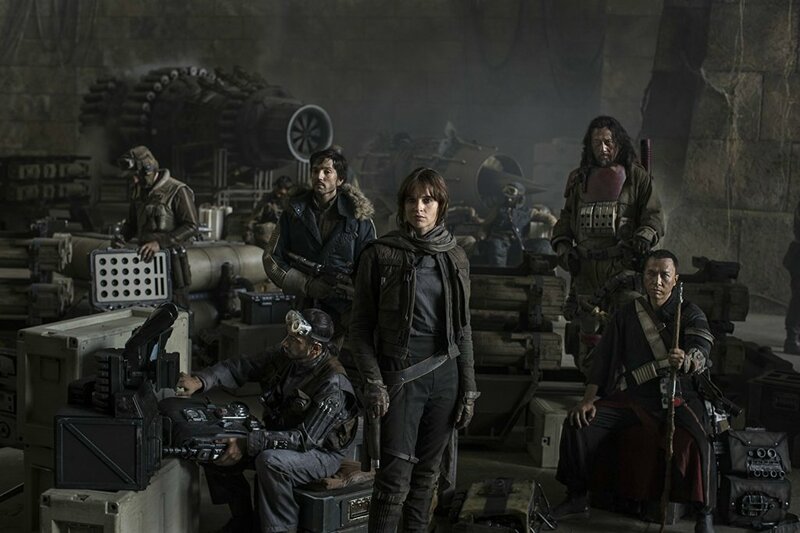 Rogue One: A Star Wars Story features an entire host of diverse characters: Jyn, Cassian, Bodi, Chirrut, and Baze. 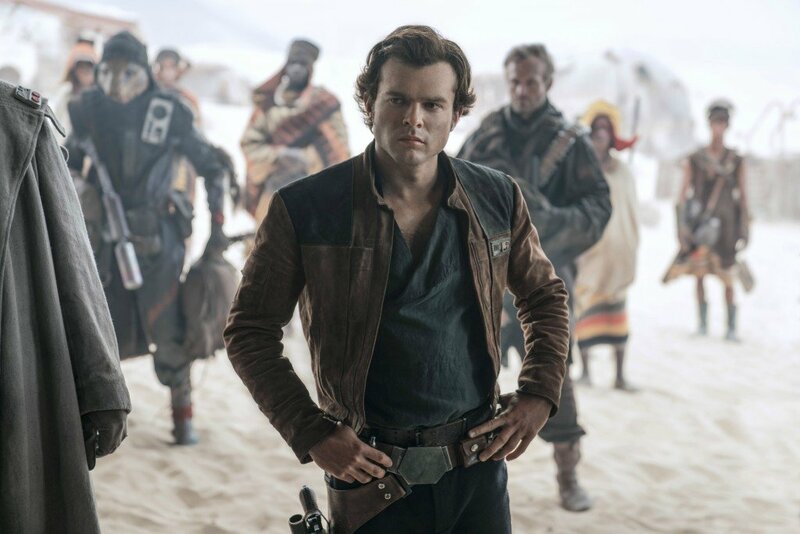 Solo: A Star Wars Story will also feature diverse characters when it comes out in May. Diverse representation is extremely important because people of all backgrounds can go to the movies and see someone who looks like them being epic and inspiring on the screen. No matter what your political beliefs are, it’s hard to deny that the world is pretty dark right now. Hope is in short supply and we can use all we can get. The new Star Wars movies, like the originals, tell a story based on hope. First, the new Star Wars movies give their audience a story about hope for the future. Like the originals, the sequel trilogy includes an evil government trying to control the galaxy, and rebels trying to resist. The sequel trilogy contains many hopeless moments, and The Last Jedi contains many failures on the part of the characters. And let’s not forget that Rogue One ends with (spoiler!) all of the protagonists dying for the cause. Despite these hopeless moments, the characters hold on to hope. Leia assures Rey, “We have everything we need” when Rey wonders how they will build a rebellion from what little they have. Leia (albeit a CGI Leia) also confirms that the tragic sacrifices made in Rogue One have finally brought the hope they need to bring down the Empire. No matter how dark things may seem, these movies tell us that there is always hope for the future. Next, the new Star Wars movies tell a story about hope for belonging. Rey is an orphan abandoned on Jakku. When it becomes clear that her family isn’t coming back, she begins looking for belonging elsewhere – with Han Solo, then Luke Skywalker, followed by Ben Solo. Finally, it seems like she has found her belonging in the Resistance with Finn, Poe, Chewie, and Leia. Rey is not the only character searching for belonging. Ben Solo (spoilers!) was feared by his own family, and he sought belonging with Snoke. When it became clear that Snoke didn’t offer what he needed, Kylo turned to Rey, who inevitably let him down, too. And that leads to the third aspect of hope these movies bring to their audience. If you’ve seen The Last Jedi (and I hope you have if you’re reading this post! ), you know that Kylo Ren is really Ben Solo, the scared boy whose master had failed him. Piecing together his back story from the novels, we know Leia knew he had equal parts light and darkness. She wanted her son to be trained in the light, so she sent him to train with Luke. Luke did not believe he (or anyone) could turn Ben from Snoke’s influence, and his fear turned Ben Solo into Kylo Ren. Despite her son’s dark side, Leia believed he could be turned, begging Han to bring their son home. When Leia’s hope for her son’s redemption failed, Rey believed Ben Solo would turn. Finally, Luke reassures Leia that “No one’s ever really gone” when she tells him she knows her son is gone. No matter how dark Ben Solo/Kylo Ren appears, there is always one character (and many audience members) cheering for his redemption. Have the new Star Wars movies diverged from George Lucas’s vision? Perhaps. But when it comes down to it, there are so many parallels between these new movies and the originals. Some fans might be able to present a case for why the new movies don’t fit the original canon, but here’s the bottom line: the new Star Wars movies are preserving the legacy of Star Wars and gifting it to a new generation of fans. There are similar, powerful themes between the original trilogy and the new Star Wars movies, and this just reiterates that Star Wars – whether the original trilogy or the new movies – is still relevant. As I explained earlier, although Star Wars was a part of my childhood, I didn’t absolutely love it until I saw the new movies. Although Leia and Padme were both central characters in the originals and prequels, there weren’t enough female characters in the movies. If I wanted to role play Star Wars with a girl friend, we had to create a second female character ourselves. Not to mention, no matter how awesome Leia and Padme are, I always wanted to be a Jedi. Now, with the new movies, I see characters I can relate to. There’s a girl character wielding a light saber. Girls can be Jedis, too! Jyn Erso was an essential character in Rogue One, and I didn’t feel like she was just there to be the pretty face. Again, Leia and Padme are awesome, but they’re just side characters compared to their male counterparts. Now, little girls have so many female characters to role play and look up to (and I am not-so-secretly jealous). And there you have it! 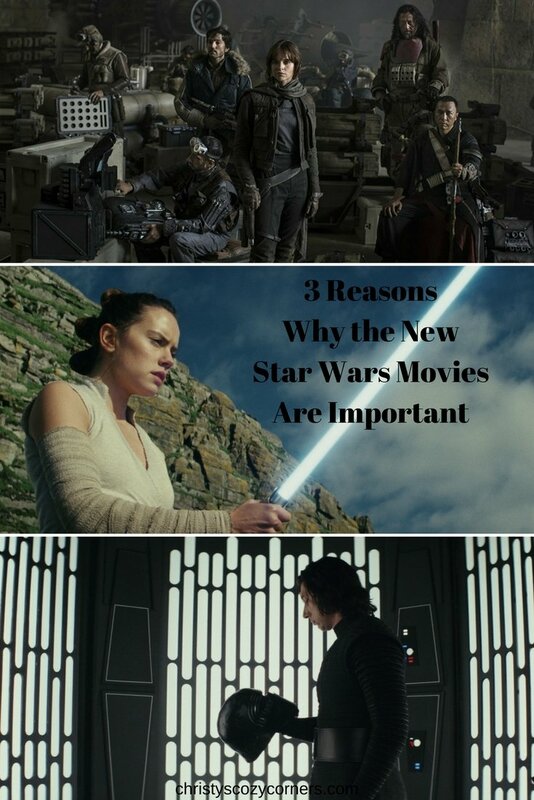 The three reasons I think the new Star Wars movies are important, plus why they are important to me. What are some reasons they are important to you? This was a very cool read. Neat perspective. My husband and son are big fans of Star Wars. One was happy with the last movie but the other was not. Aww. Tell them they can duel over it with light sabers 🙂 I know this isn’t a rule, but I think a lot of the disagreement on the new movies is between the generations – those who have had Star Wars for decades and those who are just getting in to the movies. I love your positive outlook and what great points! I definitely agree with you. 🙂 Thank you so much for sharing this! Really motivating quotes in star wars movie.. the golden one from yoda motivates me. Yes, Star Wars definitely has a lot of quotes you can pull out for a good pep talk! I am a huge fan of all the Star Wars movies, i will be watching the last one this weekend. I think I’ve seen The Last Jedi about 5 times now… 🙂 I love it so much! These are interesting points! I never thought before that these movies inspired hope. We all have our fandoms 🙂 Thanks for stopping by and checking out this post anyways! My 3 year old grandson is in love with all Star Wars. He knows all the characters. I love it when little kids get into a movie series. They are so enthusiastic! The new movies are nothing like the originals and put forth a SJW mindset. They completely destroyed Luke and Han in the new trilogy. I could write a novel about it myself, if I was so inclined. I mean, I named my kid after Obiwan…that’s how important the movies were to me. The Last Jedi will be the first movie I do not own. It’s the first I waited until it went to the cheap theater so that I could see it. The problem is that they pushed the very agendas you are praising and sacrificed the mythology and history that was already established. They also destroyed the men to elevate the women which is just as awful. I am hoping that JJ can save this mess but I have my doubts. I am hooked on Star Wars! I like it not just for diversity, but because i’ve always been a Sci-Fi fan and these stories are captivating and imaginative! Even though i’m still mad that they killed off Solo!! I do want to see that movie about him and Chewy!! This is very interesting to me because growing up I was never a Star Wars fan. I never saw any of the movies, knew anything about characters, etc. My boyfriend will love this! They really are awesome once you start getting into the characters and storylines! I hope parents take the time to discuss these points with their kids! I grew up with the old Star Wars and I love the movie very much.When it came out on DVD’s we bought it.Now we are watching the new movies they just wonderful as the old one but in a new way,you just have to keep an open mind. I probably know less than most when it comes to Star Wars! My son, whom is now grown grew up in the era. He still makes sure he sees the movies the first night available! i love star wars. i grew up with it! i’ve only recetnly caught up on all the star wars movies. i admit, they were a lot cooler than i thought. I never watch the first series of Star Wars and figured no since in watching the new one that came out because I would be lost probably. I just didn’t see the hype in star wars like so many others did. Just wasn’t my cup of tea I guess. I was never a Star Wars fan until I met my fiance and now I love it! We are huge Star Wars fans here and looking forward to seeing it. I grew up watching Star Wars, but haven’t watched the newer versions. It sounds like I’m missing out. Star Wars keeps evolving and changing. It is for the best a lot better than the original. Being a Sci-fi fan, I love anything Star Wars but I have to admit the original trilogy is my favorite. Love the uplifting post! (3 Reasons Why the New Star Wars Movies are Important) I have to admit that my three sons kinda all complained about the last new Star Wars movie that came out back in December. My family are huge fans of all the Star Wars movies. I hope the new one is as good. My hubby & son are big Star Wars fans! I love any thing Star Wars. I enjoyed reading your article, and will refer to it a lot in the future. My hubby and nephew are big fans of Star Wars movies. I watch with them and do see some good quotes in the movies.